Gabriel stands watch over Alexandria one night. He reads a passage in his bible and nods to himself, then wanders off. He clears out the pantry and the armory, making such a racket I am surprised no one woke up. He drops his bible on the floor, packs his ill-gotten gains in a car, gasses up, and drives away. Rick and his people are having another gloriously-antagonistic meeting with Gregory at the Hilltop. 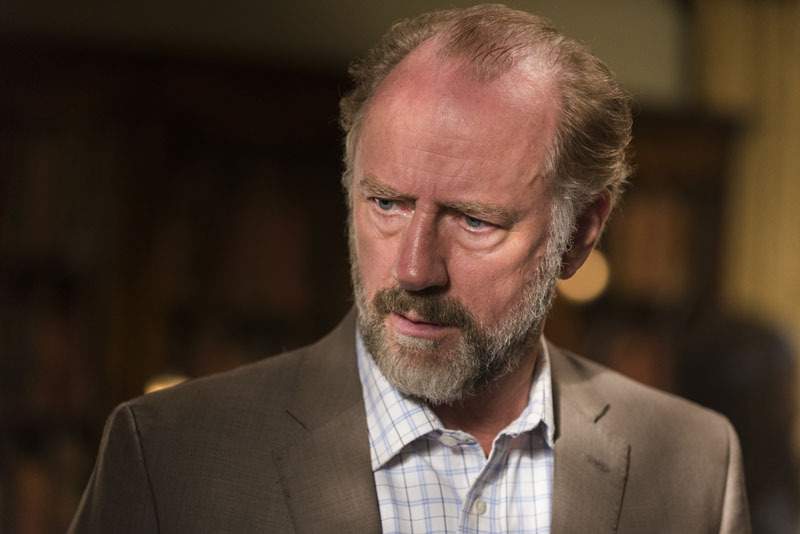 Gregory is angry that Rick’s team didn’t take out the Saviors like they promised. He believes he owes Rick nothing, that his people are farmers and won’t want to fight, and he wants Rick’s people to leave out the back door, so no one knows they were there. Though he does admit they would be better off without the Saviors, he doesn’t think his people would be any more than “cannon fodder.” The group grumbles on their way into the lobby, where Enid meets them, and tells them to come outside. About a dozen or so Hilltop residents are gathered, ready and willing to fight against the Saviors. Jesus neglected to tell Rick and his group about Shiva, so they are wary of the massive tiger chained beside Ezekiel’s throne. After the introductions are made, Rick takes his plea directly to the king. All three of their communities serve the saviors. Alexandria fought them and won, but it wasn’t until later that they learned it was just one outpost. Ezekiel is upset that Jesus told outsiders about their deal with the Saviors; most of the Kingdom doesn’t even know about the Saviors. 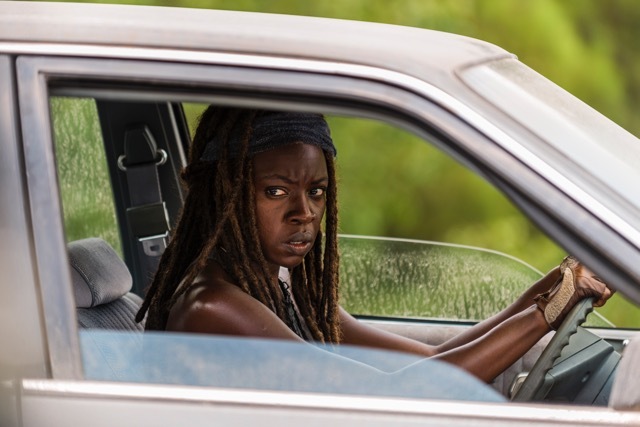 Michonne explains that several of their people have been killed by the Saviors, and Morgan is troubled when Rosita reads him the list of names. Even still, Morgan counsels Ezekiel that if they can find another way to deal with the Saviors, one that doesn’t involve violence, they should. Rick promises Ezekiel that they are strong, but there are not enough of them, and they don’t have many weapons. Richard jumps in, promising that they have both. He encourages Ezekiel to join with Rick’s crew. Ezekiel isn’t sold, but promises to ponder. Rick shares a fable that his mother used to tell him. There was a rock in the road that people used to get to town. Horses would trip over it, carriages would break wheels, causing the precious few goods families had to sell and trade to spill. One such family spilled their last cask of beer. The little girl sat there, staring at the spilled beer and the rock, wondering why no one had bothered to move the rock. So she decided to take the task upon herself. It took her hours to dig the rock from the road, and when she did, she looked in the hole and saw a bag full of gold. The king put the rock there, with the gold, knowing that whoever dug it up would deserve a reward for doing something good. In other words, the Saviors are the rock, and Rick wants the three kingdoms to be the little girl who is richly rewarded. Ezekiel seems unmoved, and will give his decree in the morning. That evening, Benjamin is out in the woods and is surprised by Carol. It seems that the purpose of this scene was largely just to work Carol into the episode. Benjamin claims he is trying to step up his training, then says that Ezekiel wants to know that Carol is okay – though he does admit that Ezekiel didn’t specifically ask him to check up on Carol. Carol is suspicious when he offers her an extra bottle of water that he keeps on him in case he finds someone in need. She declines the help curtly and Benjamin returns home. He finds Ezekiel reciting Martin Luther King Jr. speeches as a bedtime story and waits until he is done before proudly telling Ezekiel that he went out on his own and took out two dead. He also mentions Carol, but the conversation does not go any further down that road. Instead, Benjamin tells Ezekiel that they should say yes to Rick. “They are going to risk everything, whether we help or not.” If they win, the Kingdom will be saved, and Benjamin doesn’t want to live knowing they didn’t do a thing. Ezekiel is proud of him. But come morning, Ezekiel has decided he doesn’t want to send his people into battle. He reasons that he has done that before, against the dead, and people died, all because he didn’t need to send them into battle. Rick points out that the dead don’t rule them, unlike the Saviors, but Ezekiel is steadfast. “The peace we have is uneasy but it is peace. I have to hold onto it.” However, Ezekiel is sympathetic and offers Daryl asylum as long as need be, because the Saviors “do not dare set foot here.” Daryl and the rest of Rick’s crew stomp away. Richard follows, and tells Rick he wants to fight. The more they give the Saviors, the stronger they are. 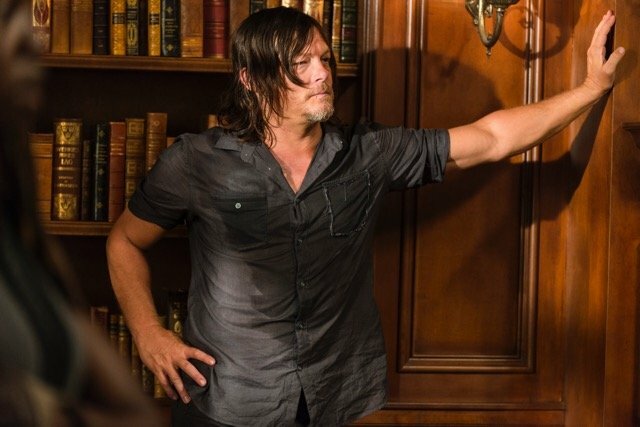 Rick makes Daryl stay at the Kingdom for his own safety, and encourages Daryl to try to talk to Ezekiel – or “stare him into submission.” Rick promises they will be back soon. 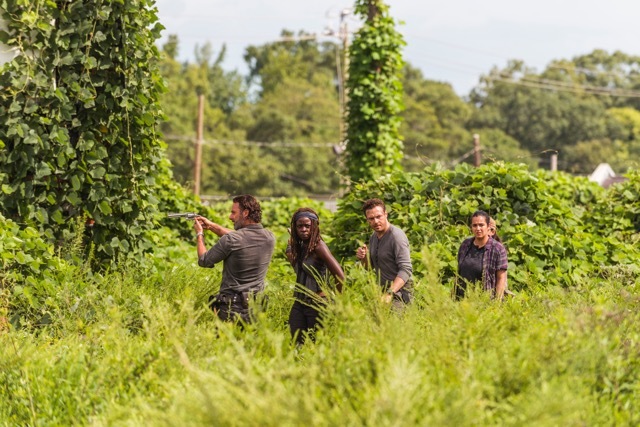 On the way home, Rick’s crew keeps tabs on the Saviors with a long-range walkie-talkie that Jesus nabbed from them. They hear Negan bemoaning the death of Fat Joey, and the fact that now Skinny Joey is just Joey. Rick’s team encounter a blockade of cars. They decide to move them, but then move them back once they pass, so that the Saviors don’t know they were there. As they get started, they discover a booby trap: a long steel cable, stretched between two cars, and all sorts of explosives set to go off. It appears to be meant for a herd of walkers, which is coming, but far enough in the distance that they have time to disarm it and take the explosives. 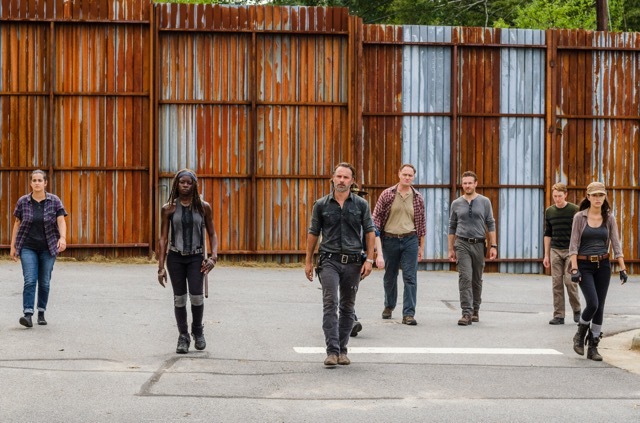 Back at Alexandria, Rick and his team arrive just ahead of the Saviors. Simon assures Rick — in a not-so-reassuring way — that they aren’t here for their tribute; they are just here for Daryl. Rick assures him that he didn’t know Daryl was even gone, but Simon isn’t buying it. His team spreads out and searches Alexandria. They smash things, check garages, closets, storm drains. This is the first time Rick sees the empty pantry. Aaron gives excuses, and Simon again promises they aren’t here for a pickup – but they might want to start scavenging. Simon decides that Daryl isn’t there, and “thanks” Rick for his honesty, while warning him that if Daryl does show up here, there is “no statute of limitation.” They drive away and the gates are sealed. Now Rick is able to turn his attention to the pantry. He is not pleased, especially when those who remained at Alexandria associated the missing food with Gabriel’s sudden disappearance. Rick and Tara don’t believe Gabriel could have done this, both sticking with their belief that Gabriel had changed. But Rick begins to think that maybe it was Gabriel when he sees his bible left on the ground. Rick also finds a journal, and on the last page he wrote what looks like BOAT. “How did he know we were out there?” Rick questions. There is a long and seemingly pointless scene of Aaron prepping to go out to search for Gabriel, and his boyfriend Eric begging him to stay. Did any of you realize that Eric was still alive? I honestly can’t remember him since, like, season five. Anyway, Aaron wins the fight because he joins Rick, Michonne, Tara, and Rosita in tracking footprints. I feel as if there were a few more scenes that were cut out right here, because I don’t actually know where they are. I guess they think they have found Gabriel’s footprints. It doesn’t matter, because within moments, the group is surrounded by a hundred or so people. Mostly women – maybe the group of ladies Tara found a few episodes ago? You can watch previews for the next episode, titled “New Best Friends,” using the player below.